The rink is proud to announce a charity hockey game that features many local hockey players, some of whom grew up playing at Hagerstown Ice & Sports Complex (HISC). 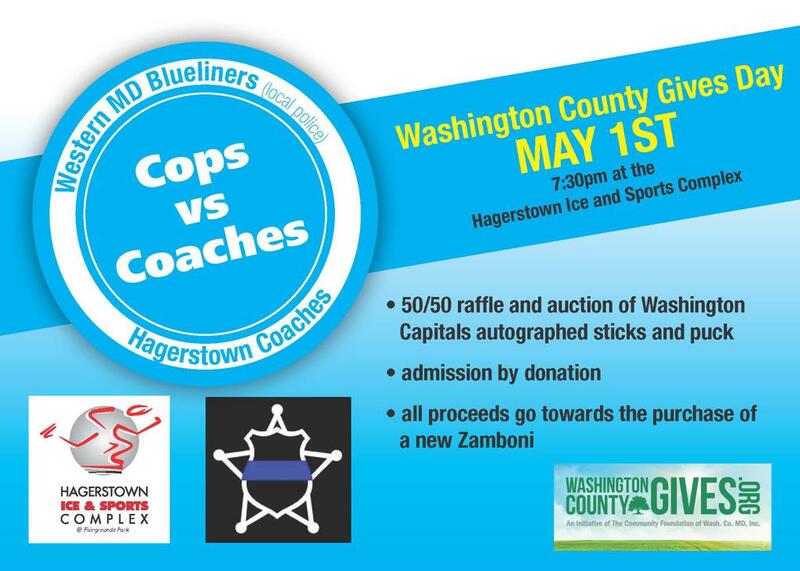 Prizes: A few items, including autographed Capitals sticks and a jersey, will be auctioned off. We are also holding a 50/50 raffle. Local police and law enforcement officers comprise the Western Maryland Blueliners. The Blueliners will face off against HISC youth coaches, rink employees and volunteers. Attendance to the game is free, but we are asking attendees to make a donation at the door. We are collecting funds to defray the cost of a new zamboni. This date was chosen as part of Washington County Gives' annual Day of Giving, an local philanthropic effort to raise funds for non-profits in the region. HISC is run by a non-profit association and managed by a volunteer board of directors.